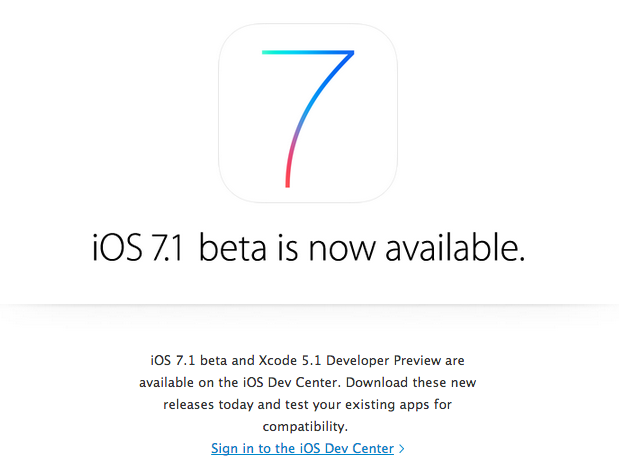 Apple today released iOS 7.1 to developers, the first major upgrade to iOS. iOS 7.1 provides many minor changes and much needed bug fixes. 7.1 features various minor changes such as a new Yahoo! logo in notification center, dark keyboard option, bold text, and a new flash indicator. iOS 7.1 will likely be released next year (as with previous versions of iOS — 5.1 and 6.1). As with any beta, there are still many bugs. Apple also seeded Xcode 5.1 and a new Apple TV update. This entry was posted in Apple, Breaking, iOS, Tech Industry and tagged Apple, ICloud, iOS, iOS 7.1, Notification Center, Operating Systems, Yahoo. Bookmark the permalink.